Obviously, the motif had to go. I wanted an American sportswear look in red, white and blue for my trip, so I had to come up with something to cover it up. 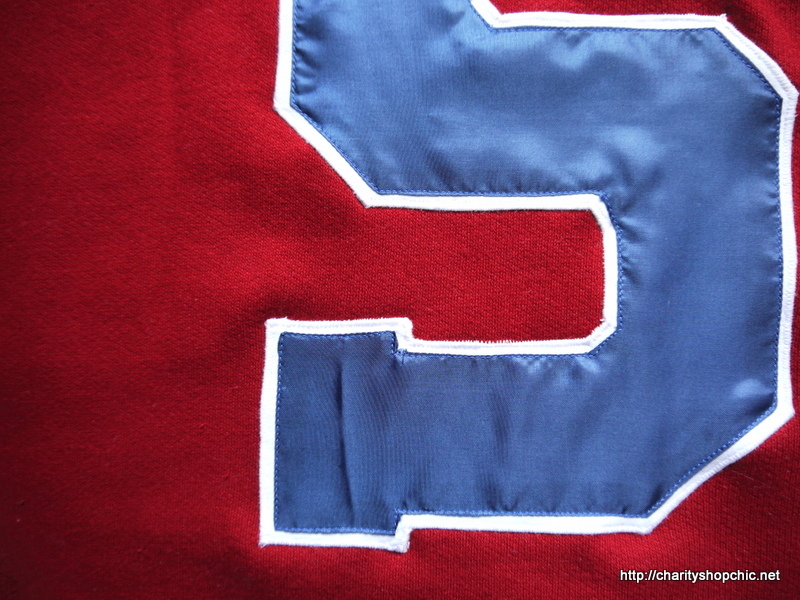 I decided on the letter “S”, partly because that’s my first initial, and partly because the top line of the S would cover the motif (that is, the letter A or number 1 would not have covered the motif). 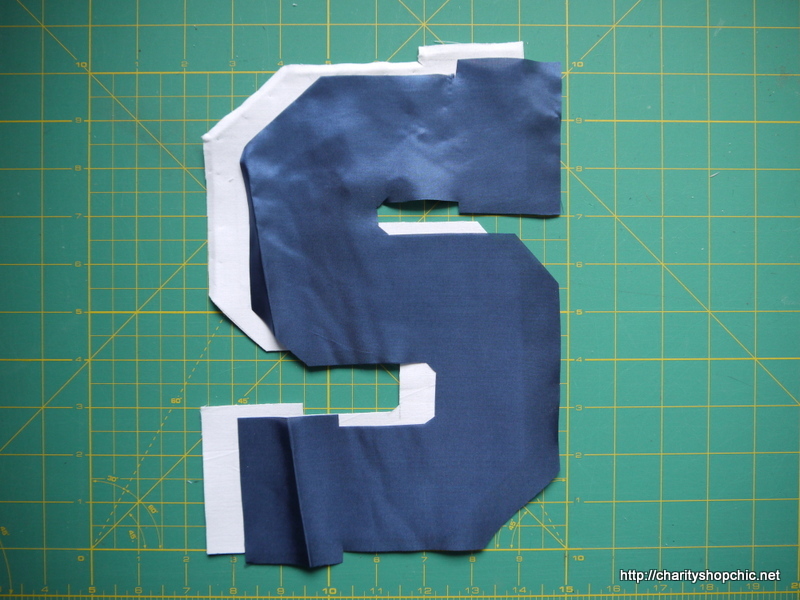 I drew out the shape of my S on a piece of paper and transferred it to some scraps of blue and white fabric. Now, I know there are probably easier ways of doing this, but this is what I did. 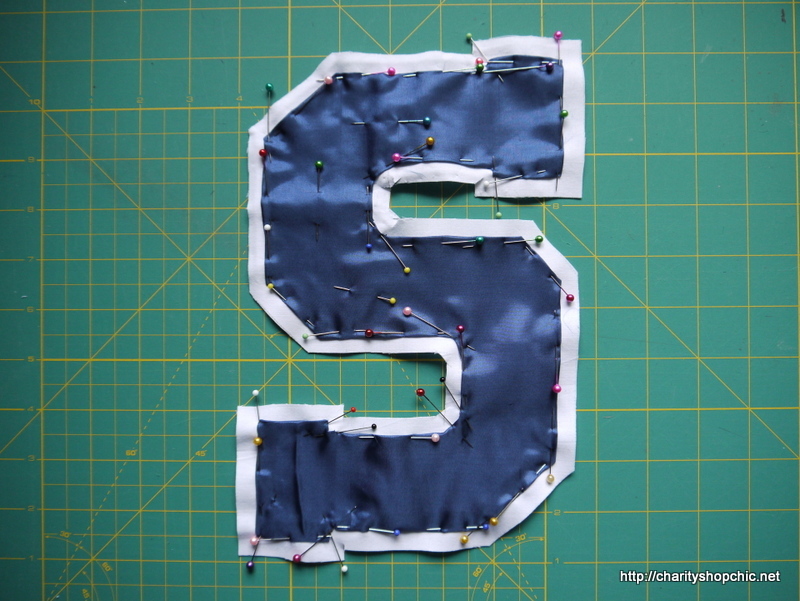 I pinned about 3mm back all around the blue S and then pinned it to the white S. This was fiddly in the extreme. 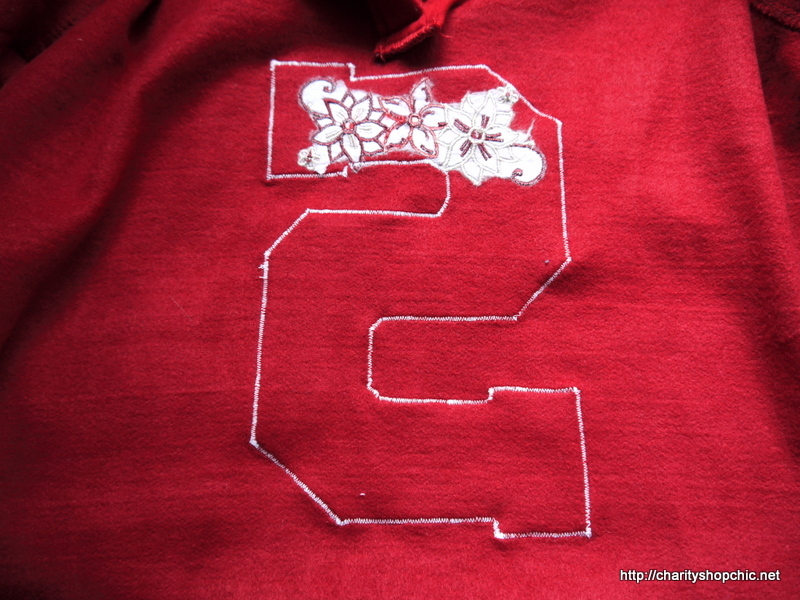 I just sewed around it using a small, straight stitch. 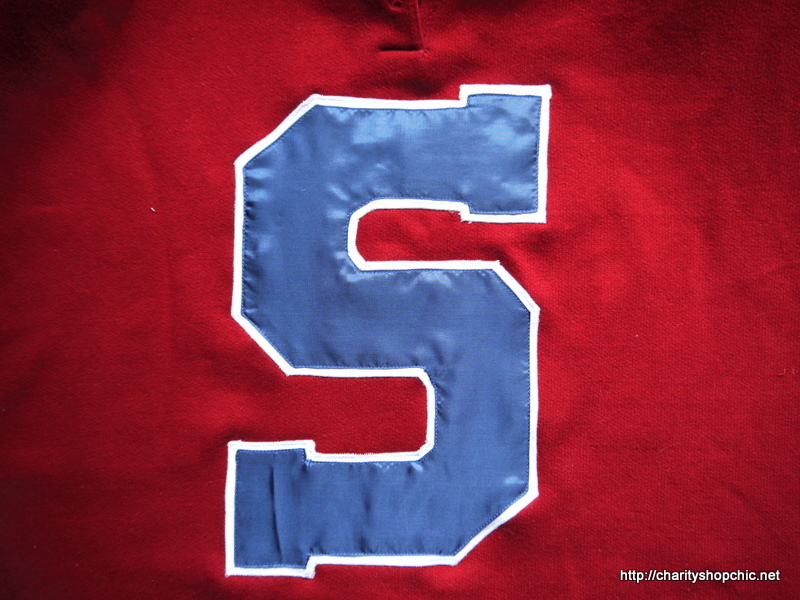 Then I folded under 3mm all around the white S, clipping corners where necessary, and pinned it to the sweatshirt. Again, fiddly as heck. I appliqe’d it on using a small, tight zig zag. All that was left to do was to make it fit. I took it in at both sides and the sleeves too. I used a narrow, long zig zag for the seam (so it had a bit of stretch) but ended up zig zagging the cut edge too as it was shedding fluff. Here’s how it looks from the inside! 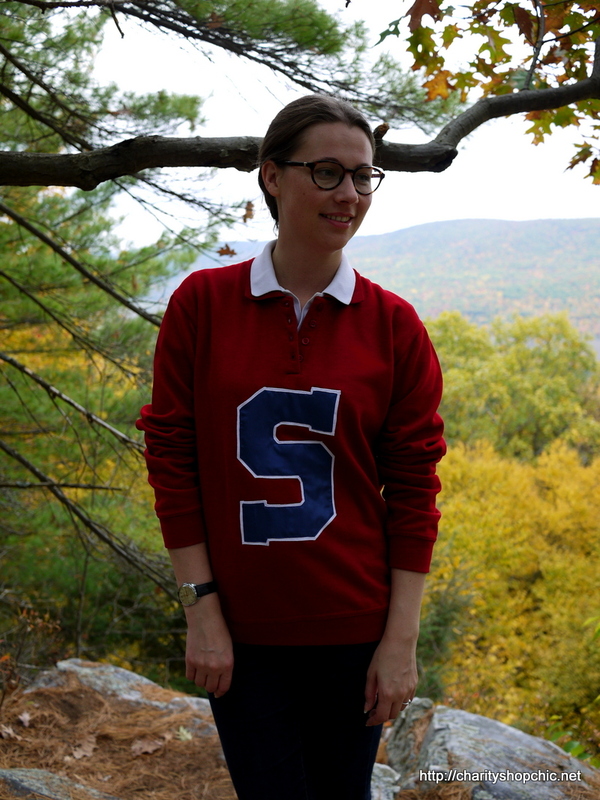 Here’s me wearing it in the US. 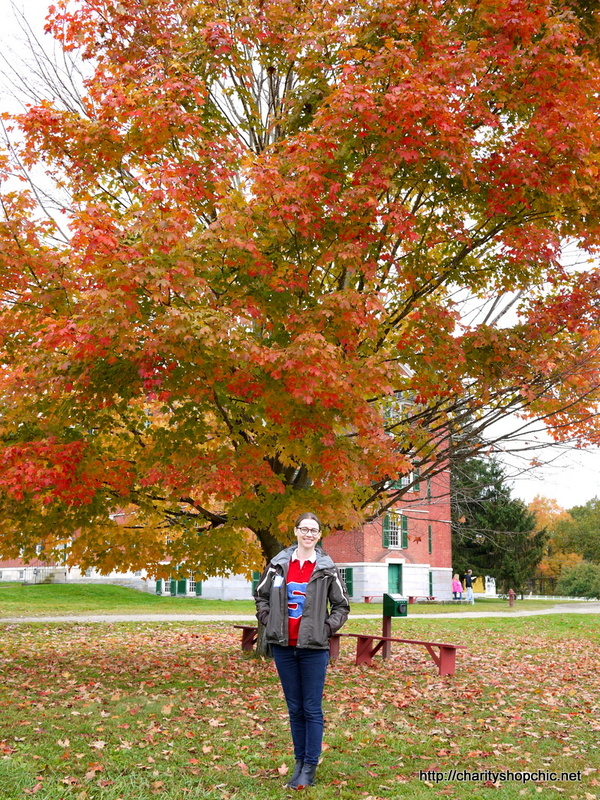 It was snuggly warm, perfect for a cold day at Hancock Shaker Village in Western MA. In the centre of the main area is this beautiful tree. 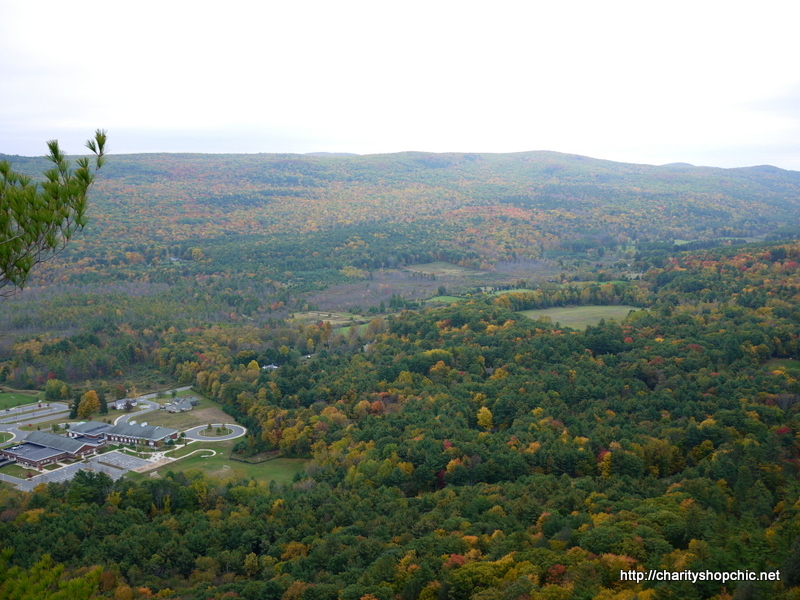 The village itself is in a lovely setting, surrounded by forest on all sides. 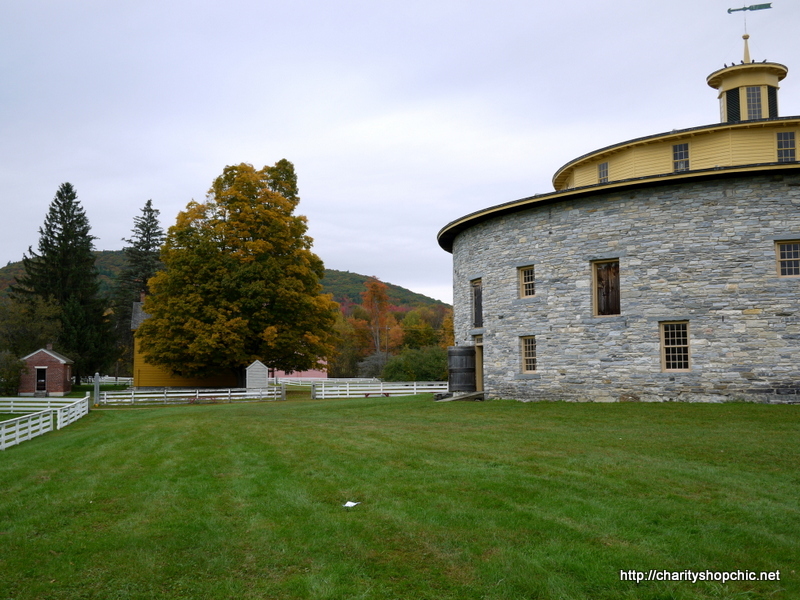 The most interesting building is the round stone barn. We don’t have round barns in the UK (well, not to my knowledge; I am not a barn expert) so I found this fascinating. The interior of the barn is actually separated into concentric circles on three different levels. At the centre is a circular air vent for the hay, to stop it spontaneously combusting. 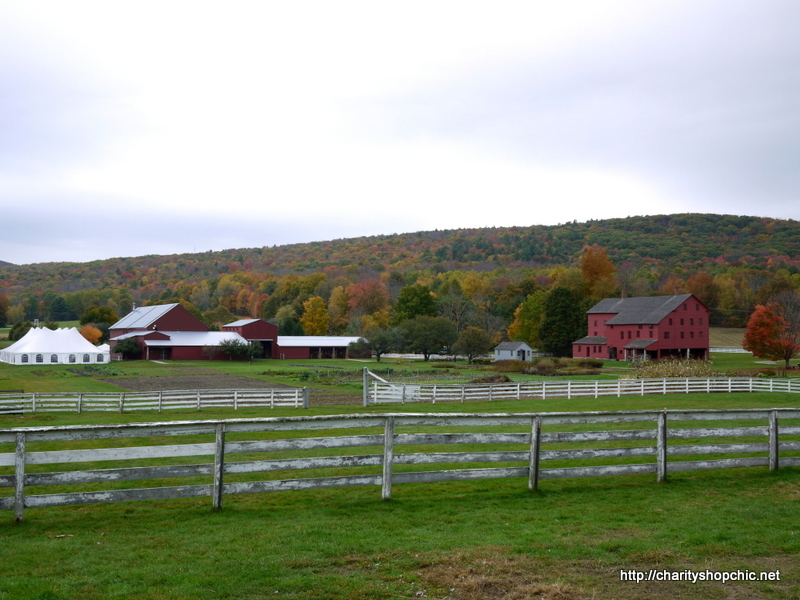 Around the vent is an inner circle in which hay is stored. Outside that is a circle where men would distribute the hay for the cattle to eat. The outer circle is where the cows are, facing inwards over a fence, eating hay. 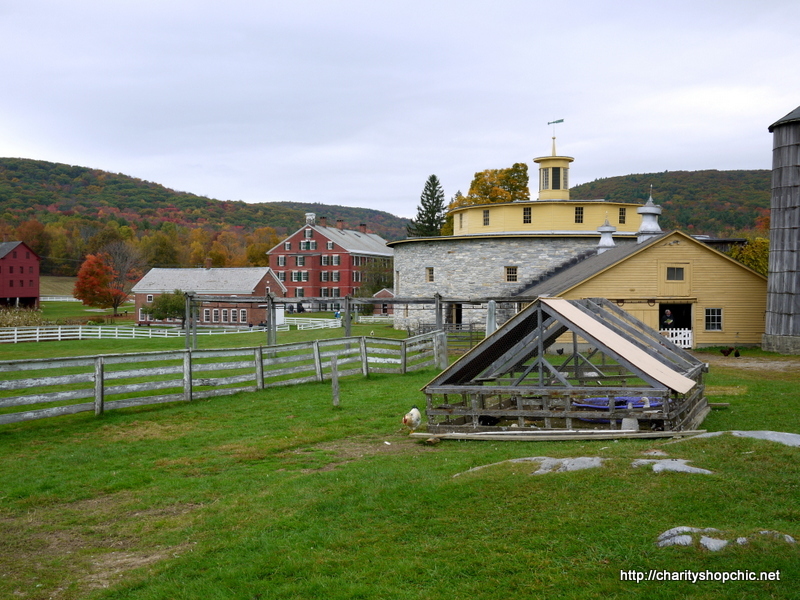 Wagons drive into the barn up a ramp to the upper level, where they deposit the hay down into the inner circle from above. The wagons go around the circle and back out the way they came in. The lower level collects manure for use as fertiliser. 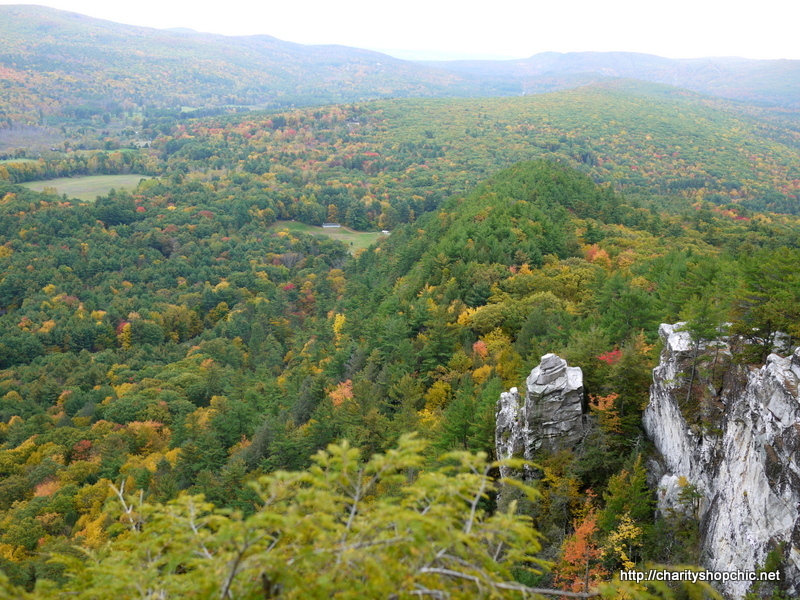 Anyway, we also stopped off at Monument Mountain on the same day for a walk to see the Autumn colours. 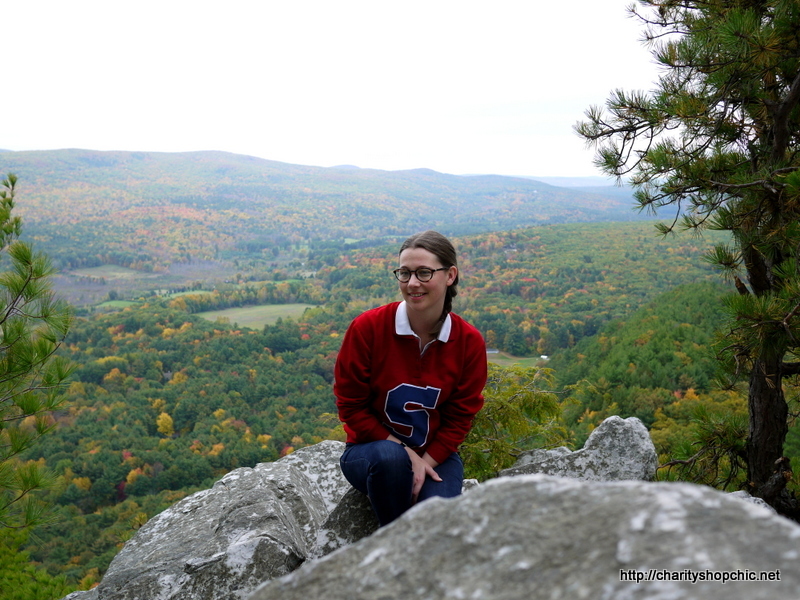 We got a great view from the top, even though the weather wasn’t totally co-operating. 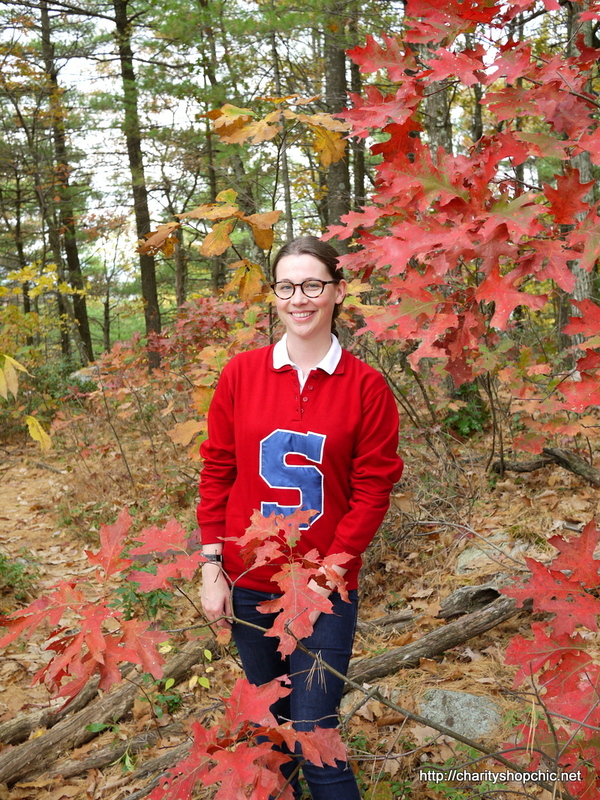 Here are some better pictures of the sweatshirt with the Connecticut foliage. Is there an easier way of doing this ‘S’? If there is, I can’t think of it! Nice refashion. Thanks, J! 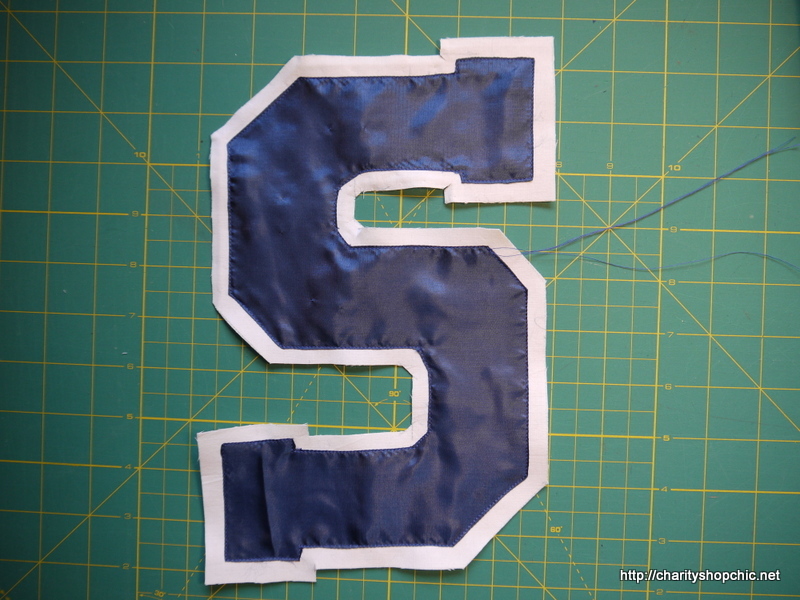 I later thought I could have piped the blue S with white, if you see what I mean… not sure it would have been that much easier, though. Crikey, what a mistake to make! I have corrected in the text, thanks for pointing it out. Such a clever and simple solution to the problem, Sally. 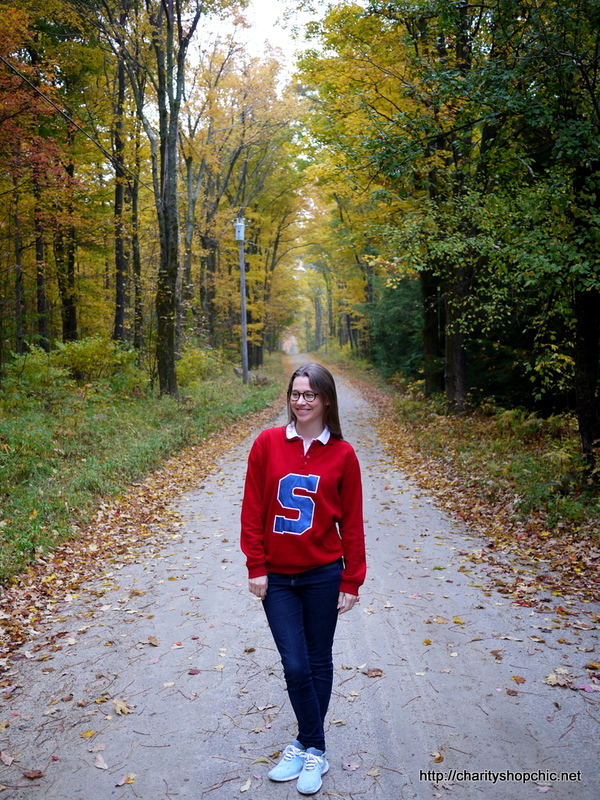 You look wonderful as does the countryside! Thanks Sue! This jumper turned out to be particularly practical when the weather got chilly. Vielen Dank! Es ist sicherlich kalt genug, um es heute hier zu tragen. Very nice “fiddly” work, you have a lot more patience than I do. Your results were very professional-looking. Thanks! 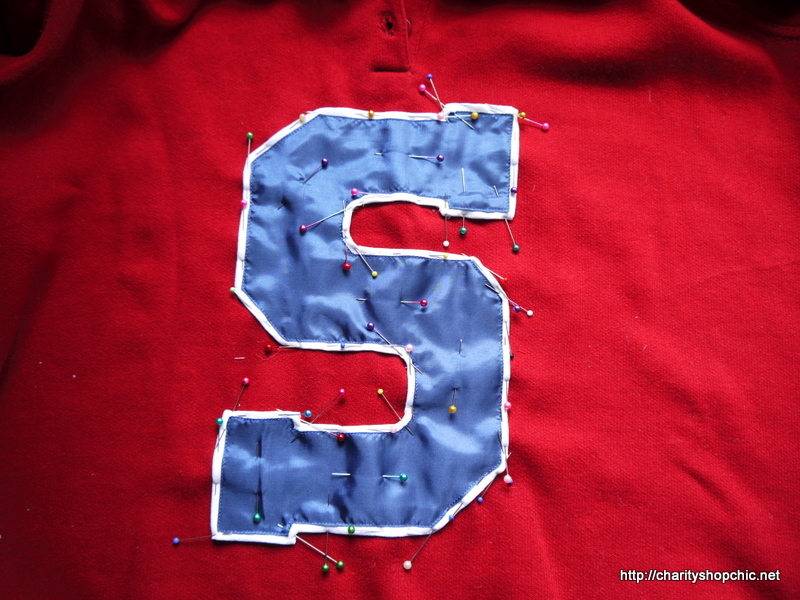 It took a while to pin it all but sewing it was quite satisfying. 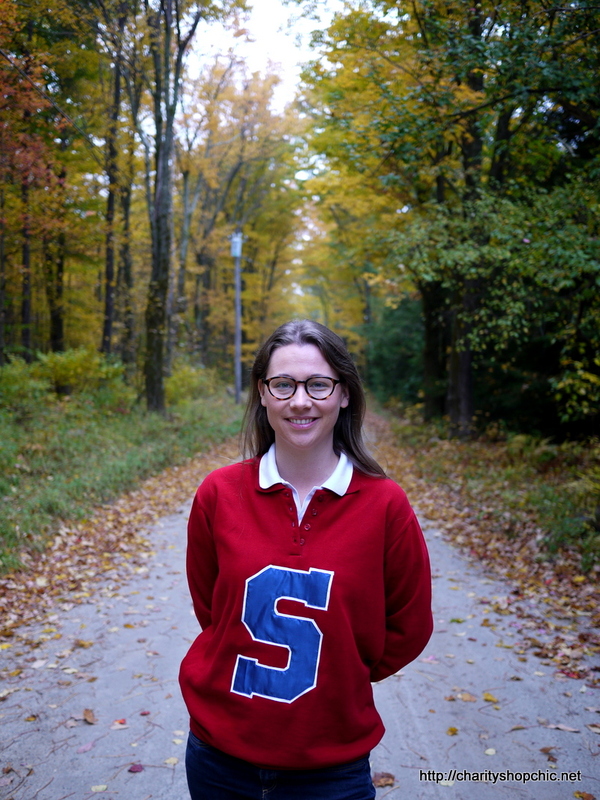 Hello Frances, what a lovely story, thanks for sharing! I hope you are still refashioning today! 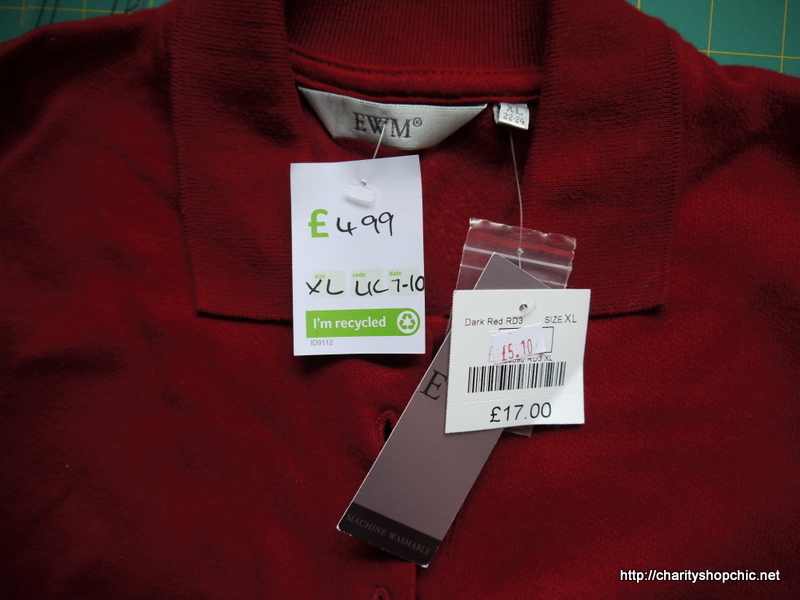 This charity shop find looked so unpromising, but you’ve done a fantastic job there! Thanks! I actually liked the collar style with the front buttons, so that made it look ‘promising’ to me! Simply beaoutiful ! And the land is absolutely amazing ! Greats photos. Glad you are enjoying reading! Thanks! You do wonderful things to clothes!!! Thanks Kezzie, it’s a fun hobby! This is awesome, but so is that BARN! 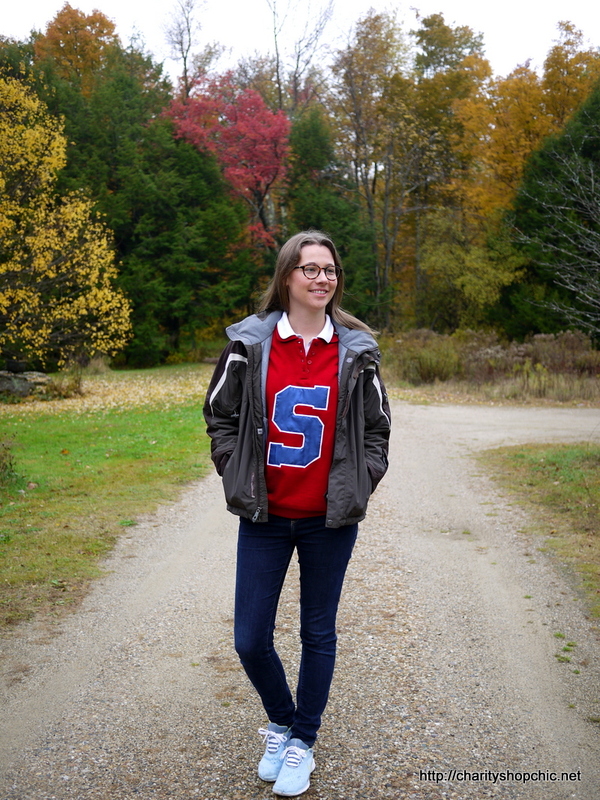 Who knew you could get excellent barn facts on a sewing blog?! Thanks for the inspiration once again. Looking forward to the next one! Yes definitely use your own initial :) Or choose a shape that covers whatever you are covering up, of course! Have fun! 06/12/2014 - 5:57 am Linda of Nice dress! Thanks, I made it!! Thank you Tracy! Glad you liked it. 06/12/2014 - 9:00 pm The S.A. Thanks, Kasia! In the case of this sweatshirt, I cut the edges off, then made the seam, then zig zagged both edges together on my regular machine when I realised it was fraying/shedding. I could have zig zagged first. 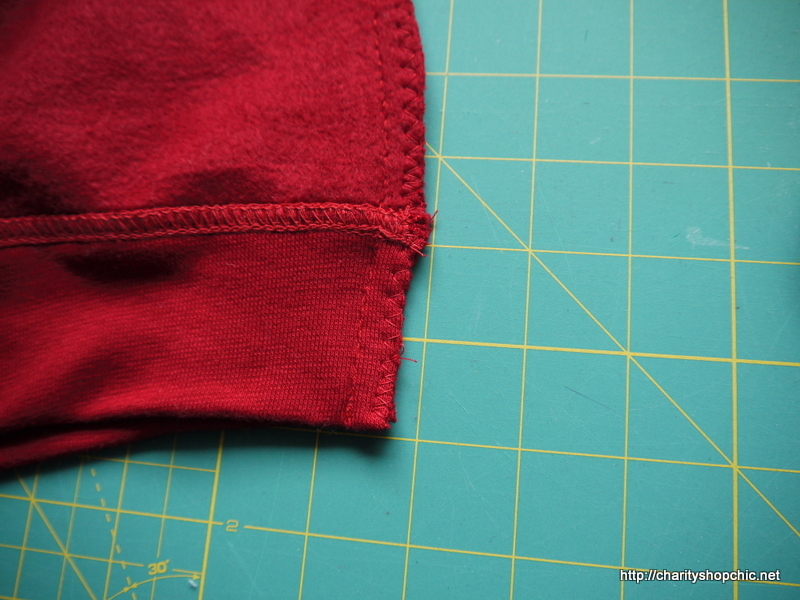 I could have zig zagged both edges separately to allow the seam to be pressed open (not really necessary here). 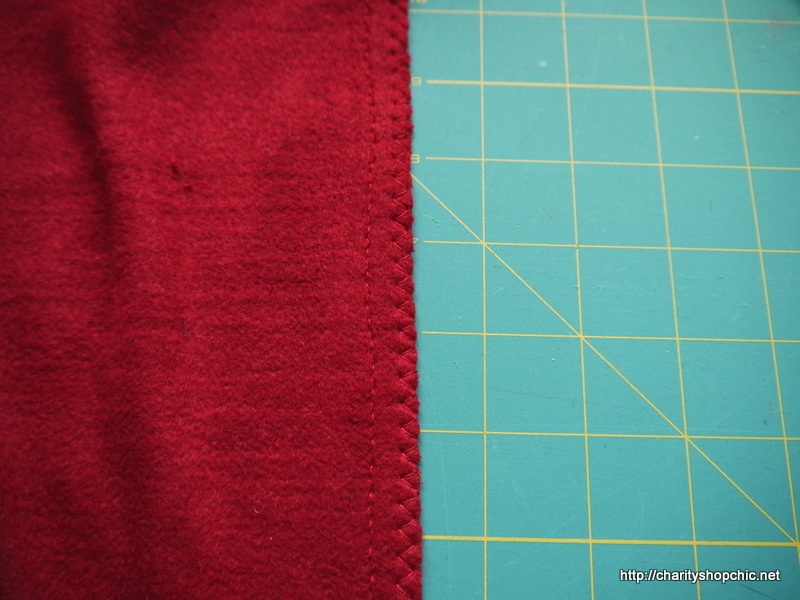 I could have used my overlocker, but that would have meant buying 3-4 rolls of red thread. There isn’t a right or wrong answer. Thanks so much for the inspiration and the scenery. 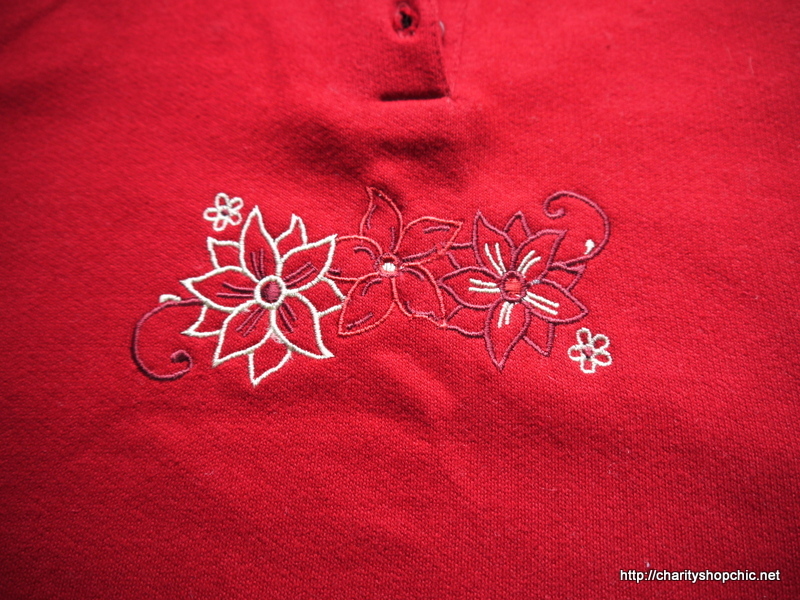 You did a fantastic job on the fitting of the large shirt and your applique is great. Thank you so much, Mariyn! And thanks for reading. 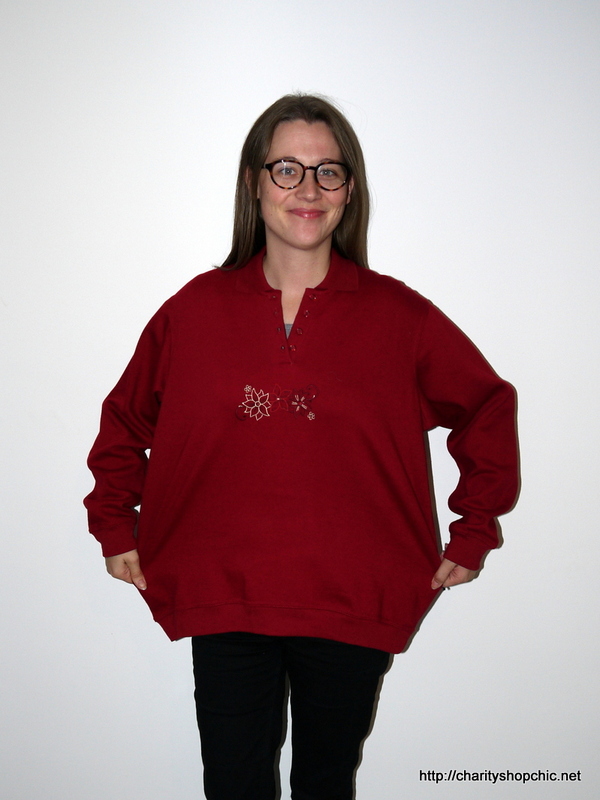 You should definitely have a go at refashioning, Jess! 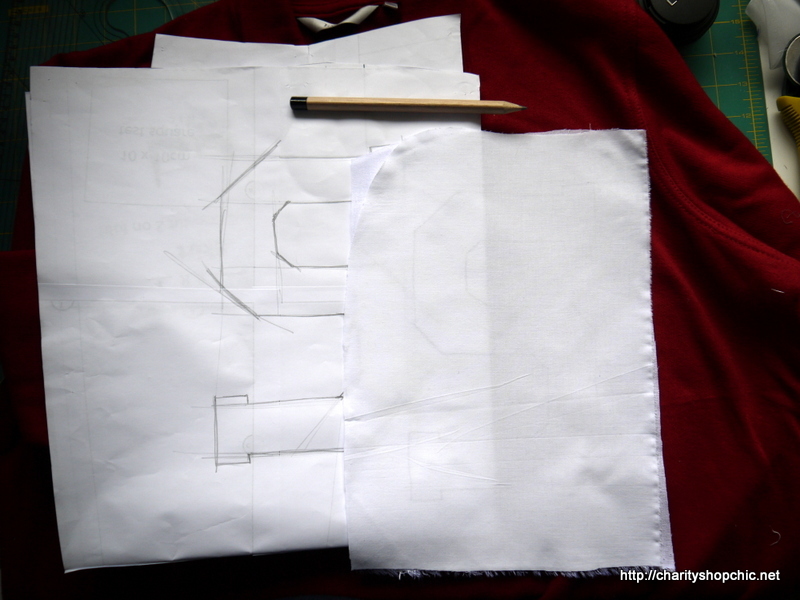 It doesn’t have to be this complicated – you can start with taking a hem up or cutting trousers into shorts. Be careful though, it can be addictive! You do some amazing things, im new to your blog but love this type of thing, I am a volunteer for EthicalStores which is much like a ethical form of etsy, maybe pop over and take a look at our stores. Hi Sam, thanks for commenting. I’ll check it out!